Thaw strawberries in refrigerator and place in large bowl. Wash bananas in cool running water and drain. Peel bananas and slice. 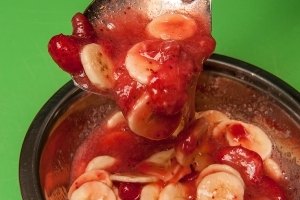 Combine with strawberries in large bowl and mix gently. Portion with #8 scoop or 4 ounce spoodle (½ cup) for each serving. Each portion provides ½ cup of fruit. 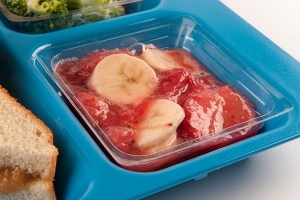 Refer to USDA FNS Food Buying Guide for School Meal Programs for quantities to purchase if different varieties of fruit are used (such as fresh, frozen, canned or diced).